There are 4 reviews for 'Antiquia Lost'. One of the better titles as collection content goes. I personally thought this this game was one of the best I have played so far. I enjoyed the massive amounts of inventory, quests, tough enemies (in the tower), but I really enjoyed trophy hunting especially for this game as it was very fair to achieve them. I think I spent the most time on this game than any other Kemco title. I clocked in about 70 hours. Level grinding was tedious until much later in the game. It takes a lot of time to resolve some quests. A Good Game. It's Worth Playing. The Skill System has some concepts that are unique from other games. There are a number of things that can be done. There are also a number of things you’ll want to do. (1) For one character, “Gems” that are dropped, found, or bought in the game, are used to “feed” the character. The attributes of the Gems typically determine the stats affected for the character. Watching what, how, and when these Gems are fed, gives a nice strategy for the player to consider. If the Gems are not eaten, they can be used as stat boosters for other party members- providing they have the available slots to place the Gems. (Never discard or sell Gems. Eat or equip them. That’s it.) It takes a long time to get “Full” from eating Gems. So you will need all you can get. (2) Brave Arts: Bine has a special ability that awakens, and reacts with, an innate ability each of his party members control. When the two party members sync, something big will happen that will benefit the entire team. When the Brave Arts meter reaches 100-percent, a Brave Arts skill can be launched again. (3) Meteorites: Found, earned & bought in the game. Some of them are powerful and a must-have. Others are not. What is very unfortunate, is you cannot see the Meteorites’ abilities until after it is given to a character. The learned Meteorite skill cannot be removed or transferred then. It’s a poor system for what could be great skills if used in the right hands. (4) Skill Strengthening from Usage: An interesting strategy is determining which skills to use more in order to increase their strength. Here’s a spoiler: if you fight in the arena or against easy random encounters with the intention to only use skills, grinding battle-after-battle, then the skill levels & their strength will increase quickly. Skills are increased by the number of times used. For example, use any specifically chosen skill, whether it is necessary or not for that battle, each turn, against weaker enemies- like heal spells, and various elemental and physical attacks- maybe certain buffs and debuffs, if you desire. Keep attacking and healing with your favorite skills whether or not you need that specific attack, or whether or not you need that specific healing ability. Just do it every turn and every battle, until you increase the strength of the abilities to a comfortable or OP level. The game has a design to repeat the last skill with just a click of the “auto” button on the left side of the screen. We don’t have to go through multiple menu lists that way. Utilize that feature! Skill’s levels and strength will reach fruition more quickly since we don’t have to choose, or reset, the skills with every single turn. Going through this entire process will prove to be a useful strategy, and we will be thankful for it, as we get deeper into the game. The early efforts of repeated mundane battles and attacks, will pay off with being able to use OP skills and techniques against otherwise deadly enemies. (5) Trust Levels and Their Increased Abilities: Just like when any new people meet, they really don’t have trust in each other. In Antiquia Lost, as the party gains Trust through designated events and items, three teammates improve a unique skill that can be used outside the battlefield. One character can pick locks, one can crush rocks, and one can squeeze into small places- like mouse holes. From early in the game, you’ll notice the areas where you can pick, crush, and squeeze. For some areas, your “Trust” level may not be high enough to meet the required mastery for the skill’s complexity. In that case, make note of the location of the lock, rock, or hole, and return to it later to claim the treasure behind it. (7) Mechanics of Using so Many Skills: There are so many skills to learn, and there will be many favorites to master. Each character has a specific elemental magic and/or physical attack they master. On top of that, each char can learn every elemental magic spell. Having five different types of skills (which includes Meteorite), and some of the learned skills end up creating two pages, it can make the scrolling to reach the appropriate attack or measure a little cumbersome. Battles are turn-based. The gameplay is largely linear. (That is not so unusual for RPGs. So it’s not a good or bad thing.) At certain points in the game, other areas to explore become available. The new areas make the game more challenging, fun & diverse. There is post-game content to play. The few areas that gradually unlock can be explored & challenged to help increase gold, XP, and char levels. There are also special tokens/items we can “grind” for that will nicely enhance char items or stats, or improve our gameplay experience. Those non-linear events will give a bigger purpose to the game that aren’t boring to do. The graphics are crystal clear. Artwork is beautiful. When characters equip new weps and armor, you can see the difference in the character’s appearance in battle. The dialogue is redundant or unrealistic, and it is often pointless. This game could probably be played without any dialogue at all. Unfortunate. The potential for a great (or better written) story is most certainly there. There is considerable mystery surrounding the NPC, Alma. Alma adds fun and intrigue to the game, and he also affects the party’s attitude at times, which adds drama and deepens the mystery. Alma’s appearances always add some suspense, questions, or pep to the story. Without Alma and everything that surrounds him, the game would flatline. Alma doesn’t shoulder the entire game’s story by no means. However, the plot is shallow, and the story’s only sub-plot IS Alma. To look deeper into the storyline, it does appear that Alma is more than one vital organ for the game. Regardless of any less-than-stellar review I write, I enjoyed this game immensely. I’ve played it more than once. 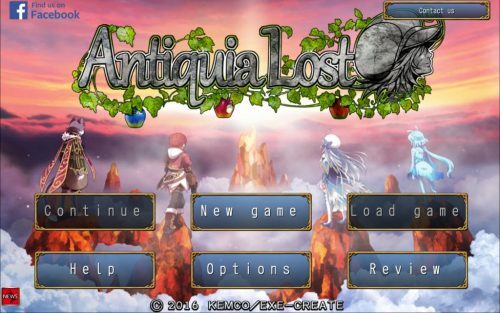 Antiquia Lost is reminiscent of old-school 16-bit console games that have been re-mastered. It has a pleasantry about it that makes anything that could be undesirable just fade into the background while you play. Who do you give Meteorites to?